Due to circumstances, I intend to enter the industry, preferably focusing on players/gamers online interactions or user research. The authors wrote a brief literature review on videogames research. Content in videogames affect people’s behaviours, emotions and thinking, violent or non-violent. Violent videogames increase aggression and conversely non-violent videogames decrease or at least not increase aggression. The authors noted that today the internet is ubiquitous and videogames are normalizing online gaming as part of the experience. Massively multiplayer online video games are designed solely for online play and with massive numbers of players for group play and social interactions among others. One particular social concept in MMOs is the social group, i.e. clans or guilds (both are valid under the urban dictionary, but I’ll stick with clans following the authors’ usage). Clans are peculiar in that having a persistent and stable social group can provide social support, structure and teamwork. The authors surmise that these benefits might counteract the drawbacks of violent video game play. Thus, the authors examined how violent behavior or externalizing behaviours, as commonly termed in adolescent research, differs among those who are in clans versus those who are not. The authors noted in a paragraph that their study came from the Growing up with Media survey conducted in 2006-2008 whose main mission was to examine the relationship between violent behavior and violent media. This unfortunately reduced the accuracy of their MMO-related questions as it was not its primary focus. Also IMO, World of Warcraft was relatively new at the time of the survey, so MMOs were relatively less mainstream as compared to today. From my point of view about this study: it’s like you finished the game’s main quest and went to other stuff, but there were a few side quests you didn’t know about. You come back to the game a few years later to finish those side quests. Participants: This is a longitudinal survey project. At time 1 (August-September 2006), they recruited 1586 youths. At time 2 (November 2007- January 2008) , they recruited 1206 youths and at time 3 (August-November 2008) they recruited 1159 youths. They did try to recruit the same youths for each time survey. They survey was conducted by Harris Poll Online, a survey company since they have the means to survey a representative sample of the population. MMO-related questions: “how often do you MMOs?” response range from never to everyday. Were they “a regular member of a clan or guild” with a yes/no question. Violent content in MMO: Respondents reported whether the MMO showed physical fights, shooting or killing. There was a 4-point response. Gameplay: respondents reported the number of days they played videogames, and average number of hours they played videogames per day. Violent/externalizing behaviours: The authors used measures from the Centers for Disease Control and Prevention‘s assessment tool for measuring youth violence. Respondents reported on six aggressive behaviours (e.g., “shoved or pushed, or hit or slapped another person of your age”), they reported on nine delinquent behaviours, such as “started a fire on purpose, where you wanted something to get damaged or destroyed”. They reported on five seriously violent behaviours, such as robbery or sexual assault. All of these behaviours were asked for the past 12 months. FYI, externalizing behaviours among youths are, fortunately, rare which skews the distribution, so they explained in statistics-speak how they did their analysis to account for this skewness. They analyzed how violent video game content and externalizing behaviours are associated within the same time frame. Overall, they found that aggressive and delinquent behaviours were higher among MMO players in clans as compared to non-clan MMO players. The rate was similar for serious violence behaviours, but was not significant. They did found that among players who are in clans, they reported that the MMOs showed violent content more so than those not in clans. So, they analyzed externalizing behaviours separated by clan membership and violent vs. non-violent content. They presented the results in a big table (see below). The authors conducted an analysis examining the role of gender. What they found among female players, is that being in a clan attenuate aggressive (by 16%) and seriously violent behaviours (by 10%). As for delinquent behaviours it was reduced by by 7% which the authors do not conclude that clan membership has a significant effect. Among male players, clan membership did not impact externalizing behaviours. The take home message is that clan membership in MMOs does not reduce nor affect externalizing behaviours (aggression, delinquency and seriously violent) among boys. There is an attenuation effect of clan membership for girls, the authors speculate that it might be the content have a greater impact, is more memorable for female players or aggressive girls are more drawn to MMOs that depict violence. I have no problems with their measures of externalizing behaviours given the long history of youth violence research. 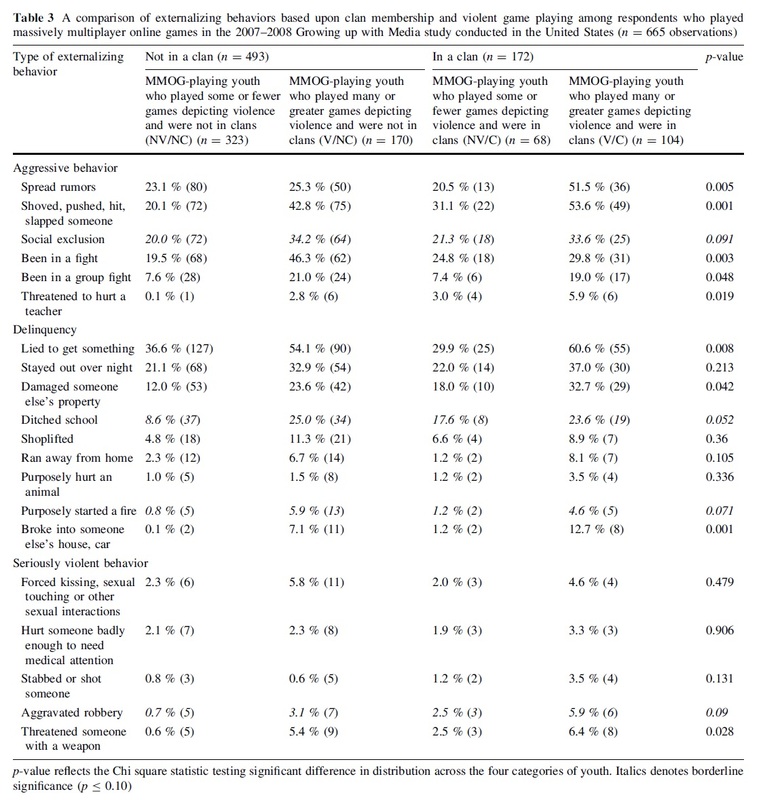 The weakest part of the study is their MMO-related part which is less accurate and has a very short research history compared to youth violence. The authors acknowledged that their definition of violence in video games might have been interpreted differently by some youths. IMO, it’s possible that some of the youths were really playing non-violent MMOs of the time like Habbo Hotel. Furthermore, I need to remind you that the data was from 2006-2008, who knows how much MMOs have changed since then. The authors discussed that MMO clan may have both pro-social and externalizing influence. Take a step back and think about how cliques influence members’ norms of behaviours and attitudes, a group that reinforce certain behaviours and punish undesirable ones. For example, violent youth gangs reinforcing delinquent behaviours as opposed to nerd groups actively encouraging more scholarly behaviours and discourage any physical activities. Perhaps the social dynamics of clans may be a factor in externalizing behaviours. A violent and sexist clan might influence younger or newer members to behave like the group to fit in with them which could leak into the other online environment and possibly into offline world. Conversely, there are more accepting clans encouraging civility and culturing a supportive environment. As mentioned earlier, the social dynamics of a group can be an important influence on behaviours, beliefs and attitudes. Perhaps a diverse clan membership, such as active female members or older adults or minorities, affect the social dynamic of the group. IMO, the study is a good primer for researchers towards examining the social dynamics of online social groups. The authors gave an example of how taking on roles in a group, such as healer, tanks among others could have a role between in-game violence and externalizing behaviours. Perhaps how adult players might be potential role models for young players. This entry was posted in Aggression, Social Psychology, Video games by Wai Yen Tang. Bookmark the permalink.